Quakerpress of Fgc, 9781937768584, 166pp. 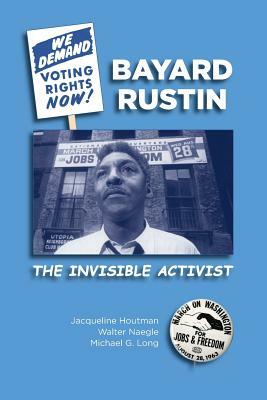 "We need, in every community, a group of angelic troublemakers" -Bayard Rustin Bayard Rustin: The Invisible Activist is a new biography for ages 10 and up. . . To many, the civil rights movement brings to mind protests, marches, boycotts, and freedom rides. They often think of people like Martin Luther King, Jr. or Rosa Parks. They seldom think of Bayard Rustin. Raised by his Quaker grandmother to believe in the value of every human being, Bayard made trouble wherever he saw injustice. As a teenager, he was arrested for sitting in the whites only section of a theater. More arrests followed, for protesting against segregation, discrimination, and war. His belief in nonviolent action as a means for social change gave him a guiding vision for the civil rights movement, which he used to mentor the young Martin Luther King, Jr. When A. Philip Randolph needed the best organizer on the planet, he turned to Bayard Rustin to bring 250,000 people to the 1963 March on Washington for Jobs and Freedom. Illustrated with over sixty photos, this book is the product of a unique collaboration between three authors: Bayard's partner of ten years, a professor of religious studies, and a children's book author. Though he is largely ignored in history books, Bayard's ideas and actions will inspire today's young (and not-so-young) readers to be angelic troublemakers.